So we’re back into the labyrinthine manor of William Mortimer. I hope you remembered what happened in Episode One because The Council will not tell you much about it. With so many branching paths you could have taken, and with two months between episodes, it might have been nicer to open with a bit of a firmer recap. But even if you’re starting on the backfoot, it’s a great joy to pick up this story once again. Beware of spoilers for Episode One in this review, as it’s hard enough to talk about narrative heavy games in the first place, let alone episodic ones. Having been accused of murder, Episode Two of The Council starts with a great moment, finally introducing you to the host of this little party. It’s possible that the lackluster introduction was to keep you off guard for the opening interrogation, which does immediately make you feel awkward and vulnerable, trying to prove your innocence while only vaguely remembering the crime. This opening confrontation is however an outlier for the episode that focuses more on physical puzzles than dialogue trees. The puzzles in Episode Two “Hide and Seek” take pride of place, which does put the dialogue sadly in the background. Although having said that, perhaps there are more confrontations that I missed in the mansions many halls and objectives. Either way, my time with the puzzles was a mixed bag for Episode Two where some interesting ideas felt overused and tedious. Positively, a lot of the puzzles had this perilous consequence that made you really want to get the answer right the first time. Exploring the puzzle room, you might notice hints that getting the answer wrong might seriously affect the game, and in all honesty, I was actually a little scared to lock in my answer. The puzzles I did get wrong left both a temporary and permanent badge of shame. Puzzle games normally have very little penalty for failure, so this was a nice touch that added a sense of weight to your problem-solving. It is with huge disappointment that I have to say a lot of the puzzles were confusing, difficult and vague. Without spoiling the game, or the answers, some sections felt like there was no clear answer to be gleaned. The riddles surrounding the Bible puzzle felt vague and uncertain of themselves. This particular puzzle didn’t have a consequence for failure, other than listening to a Bible verse, but the game offers you so many verses to choose from it feels almost impossible to trial and error your way through the challenge. A later puzzle in a maze, the one that left me with its terrible mark, had me wandering back and forth before guessing. The theme of the puzzle and its solution seemed completely at odds with each other. Without spoiling it, the puzzle looks like it could be solved without outside knowledge, but that would be a lie. Like Episode One, The Council’s second episode has a few moments where if you know something your character doesn’t, you can use that knowledge, or Google it, to complete a puzzle. I really loved the puzzle in Episode One that had you revealing invisible ink, but this episode doesn’t let you feel that smart. 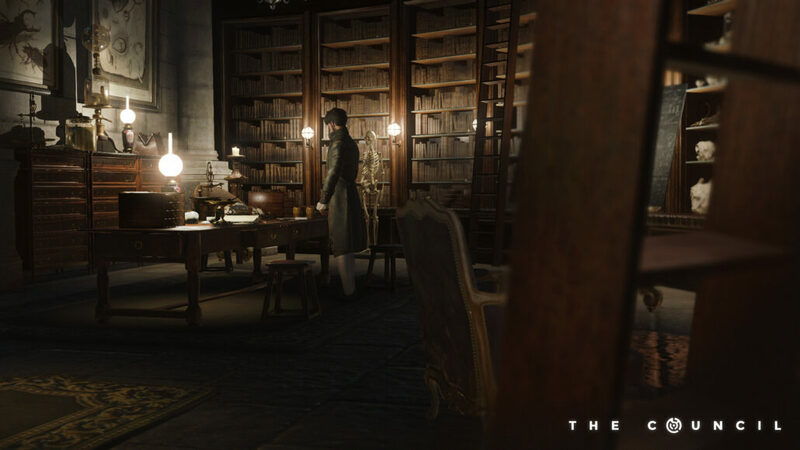 All the puzzles, however flawed were extremely creative though, with interesting and varied themes that so well fit into the overarching themes of this time period and setting. All they need a little bit of refinement so that the clues don’t feel separate from the rest of the game. Beyond the nightmare of the puzzles though, the narrative continues to weave and unravel several mysteries and is genuinely hard to put down. Like I said earlier, you get to meet the infamous Lord Mortimer this time, and the case of your missing mother takes some interesting turns with both you and the other guests on the island. The twists and surprises are well paced, with some time between most important story moments for you to digest and theorize to your heart’s content. Keeping up that level of storytelling across two episodes must be difficult, and they’ve managed it perhaps at the cost of the visuals. While mostly unimportant, Episode Two, or at least the pre-patch version I played, was rife with visual bugs. From limbs clipping through each other to objects appearing and disappearing around the various rooms, it was fairly constant throughout the whole episode. All in all, fans of The Council’s first episode will no doubt enjoy Hide and Seek for its story and narrative choices, but it doesn’t feel as tight or bold. The puzzles offer a lot of flair and seem to tie back into themselves in interesting ways, but it’s the story people will be talking about here, not the interesting but ultimately flawed puzzles. Reviewed on PlayStation 4. You may purchase the game for PC on Fanatical.